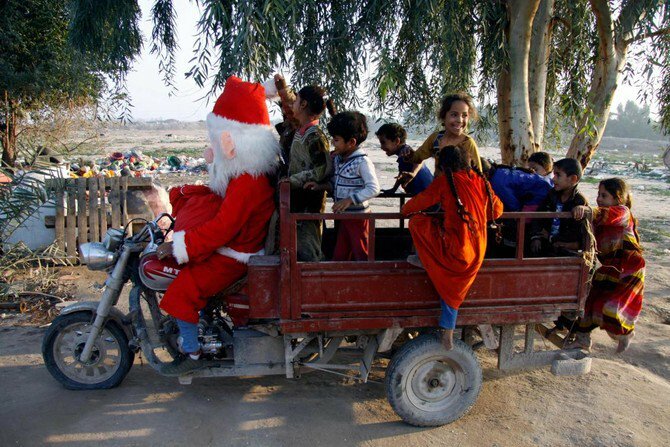 BAGHDAD: Iraqi Christians quietly celebrated Christmas on Tuesday amid improved security, more than a year after the country declared victory over Daesh militants who threatened to end their 2,000-year history in Iraq. But war and sectarian conflict shrank Iraq’s Christian population from 1.5 million to about 400,000 after the US-led invasion in 2003. Following the onslaught of Daesh in 2014 and the brutal three-year war that followed their numbers have fallen further, though it is not known exactly by how much. In Baghdad, Christians celebrated mass on Tuesday morning — declared a national holiday by government — in churches decorated for Christmas. Once fearful, they said they were now hopeful, since conditions had improved. “Of course we can say the security situation is better than in previous years,” said Father Basilius, leader of the St. George Chaldean Church in Baghdad where more than a hundred congregants attended Christmas mass. Iraq declared victory over the militants more than a year ago, but the damage done to Christian enclaves on the Nineveh Plains has been extensive. In Qaraqosh, a town also known as Hamdaniya which lies 15 km (10 miles) west of Mosul, the damage is still visible. At the city’s Immaculate Church, which belongs to the Syrian Catholic denomination and has not yet been rebuilt since the militants set it on fire in 2014, Christians gathered for midnight mass on Monday, surrounded by blackened walls still tagged with Daesh graffiti. Dozens of worshippers prayed and received communion, and then gathered around the traditional bonfire in the church’s courtyard. Before the militant onslaught, Qaraqosh was the largest Christian settlement in Iraq, with a population of more than 50,000. But today only a few hundred families have returned. Faced with a choice to convert, pay a tax or die, many Christians in the Nineveh Plains fled to nearby towns and cities and some eventually moved abroad.